I’ve been a little distracted from Magic lately, and not even grinding the PPTQ season as planned. But all it takes for that to change is a well-timed spoiler from Wizards. Ixalan‘s been delivering plenty of those, and between the dripping-with-flavor new cards and the juicy-looking Magic: Arena, I’m back on the proverbial horse—the brewing horse, that is. In this article, I’ll take you through my brewing process this week, which saw me trying to fit into a Delver of Secrets shell. A few factors pushed me to experiment with . For one, I enjoy brewing with new spoilers; for another, Vanguard seemed like a quick solution to some problems I’ve been noticing in the kinds of decks I play. I’ve been playing lots with Counter-Cat lately, and one thing that comes up against black decks is the fragility of Tarmogoyf. If I’m going to spend two mana on a beater, I want that creature not to die to commonly-played removal spells at a parity loss. That used to be Tarmogoyf‘s strength in Modern: removing it meant trading evenly on mana with something like Terminate, losing tempo with something like Maelstrom Pulse, or giving opponents a land with Path to Exile. Hence why Spell Snare and Liliana of the Veil shone so brightly; they were the only good answers to Tarmogoyf. Goyf is still Goyf. It applies lots of pressure for two mana, and plays defense as admirably as offense. But the presence of Fatal Push in the format undermines Tarmogoyf in an unprecedented way. While perusing the latest Ixalan spoilers, a relatively simple card caught my eye: . This two-mana Vampire turned sideways for three and would be impossible to kill cleanly—the neatest removal spell was Path to Exile, which as mentioned carries a hefty drawback in the tempo-oriented Modern format. Everything else becomes Vexing Devil, a card shunned by competitive players for its dealbreaker punisher mechanic. Granted, turning all your opponent’s removal spells into Vexing Devil isn’t a sure-fire way to win. Vexing Devil is indeed quite good in multiples. But there happens to be a card in Modern’s card pool that rewards players for taking damage. And since ‘s ability can be activated at will, the Vampire boasts palpable synergy with Death’s Shadow. I didn’t have to look long to find a shell. Instead, I immediately tried fitting into a build of Counter-Cat, my Wild-Nacatl-featuring Delver deck. I’ve tried running Death’s Shadow and Delver of Secrets together before. The main problem I ran into there was a deckbuilding one: Delver required a critical mass of instants and sorceries, and Shadow required, well, Street Wraith. That one threat then took up eight creature slots, making Delver less reliable unless I was willing to pack fewer actual threats than I’d have liked. That’s what I did, and the deck failed. represented a solution to this problem. A threat itself, the Vampire wouldn’t take up precious slots for air. It also supported Shadow as well as Wraith, if not better, constantly threatening a pseudo-Hatred effect whenever the two co-existed on the field. Incorporating Vanguard and Shadow into a Delver shell would allow me the threat-heavy lineup I was used to while ostensibly adding better cards into the deck’s answer pool, as well as an aggro-combo dimension. To approach the project, I broke down Counter-Cat by color. Blue was necessary for cantrips and permission, which form its backbone. The other colors played were green, for threats, and white/red, for removal and to support Wild Nacatl. With Nacatl out of the picture, red seemed vestigial, and green was made unnecessary by the idea of the deck in the first place: to transition away from Tarmogoyf. White and black, which I was already in for the threats, enjoy the best removal in Modern. But green was the easiest cut, since Vanguard and Shadow were lined up to replace Nacatl and Goyf anyway. To sub in for Hooting Mandrills, the best creature in the deck, I of course chose Tasigur, the Golden Fang. My initial shell then stuck to Esper colors, and otherwise tried as closely as possible to port over the Counter-Cat foundation. Since I was familiar with Counter-Cat, playtesting with a near-clone would hopefully give me insight into the changes I had to account for in these colors and with these cards. As mentioned, Vanguard replaced Tarmogoyf on the curve, but Nacatl in size; Shadow filled the role of resident fatty previously occupied by the Lhurgoyf. The counter suite remained unchanged, and the eight-pack of Bolt/Path became a split of five one-mana removal spells and a set of Thoughtseize, the latter a crucial Shadow enabler and all-around ridiculous spell. The deck’s permission suite, copy-pasted from Counter-Cat, was far worse in this shell than in its original home. Tapping out and protecting our threat, the Delver dream, proved less relevant when protects itself anyway, and Shadow comes down late enough for us to back it up with mana. Similarly, Vanguard and Shadow each provide a lot of value against the grindy interactive decks that tend to beat up on Delver strategies in the first place, so Shoal’s value in Game 1 scenarios plummets there. Spell Snare and Mana Leak, too, failed to impress. Leak is great on turn two after leading with a Delver; Counter-Cat has multiple ways to ensure this sequence thanks to Wild Nacatl. , though, costs two mana and makes expensive permission unappealing. Death’s Shadow, our new one-drop, also doesn’t resolve until past the first turn. That means Leak is often used defensively, while we set up; in such cases, removal spells generally fulfill a similar purpose and are more efficient. Spell Snare specifically played like a worse Fatal Push most of the time. That said, Spell Pierce was great in this deck. It would get even better if we could ramp up on proactivity. I covered Opt‘s implications and applications in detail last week. My take was that the card would shine in highly reactive, instant-speed decks like Jeskai, and prove lackluster elsewhere, where Sleight of Hand offers pilots making a choice twice as much information. Pilots of other decks are also likely to want to cantrip at the earliest possible opportunity anyway to make use of the card they draw on their main phase. That’s not to say I wasn’t at least interested in testing Opt, and many of the blue decks I played last week tried to squeeze some copies in. Counter-Cat likes a pair of Thought Scour to enable quick Hooting Mandrills, but also to have something to do on an opponent’s end step after holding up Leak/Pierce/Snare/Shoal/Snap for a turn. Kelsey’s testing revealed that two one-mana, instant-speed cantrips was the right number. Since Counter-Vamp only runs two delve threats and no Goyfs, I figured the velocity of Thought Scour might be less important than the card selection of Opt, and tested with the Ixalan cantrip. It turns out even with so few graveyard synergies, Scour’s velocity was sorely missed. I split my bottoms and tops with Opt maybe 50-50, but still wished I could have a blind dumping effect over the scry nearly every time. It’s generally correct to just throw Opts on the opponent’s end step if possible, as we usually need more cards and will always need the mana down the road. But the kind of card we drew mattered less than the cycling effect, indicating Scour would be better in this slot. Even with 4 Thoughtseize, the 3 Push/2 Path split still left me wanting, homesick for Counter-Cat’s heavy removal suite. Using Bolt, Push, or Path on an opponent’s creature often robs them of tempo, since they’ve invested resources into resolving that creature; Thoughtseize does no such thing. While it’s great at stripping an opponent of options, the targeted discard spell is somewhat at odds with the Delver school of tempo swings, no matter how necessary it is with Death’s Shadow. Esper also suffered from utility issues. I found it challenging to remove pesky permanents like Chalice of the Void or Ensnaring Bridge post-board, or to win through them, which informed some of the sideboard decisions (no, Disenchant is not the card I was most excited to run in my sideboard). Boards full of small creatures also pestered me, even with the Last Hope. As with Fatal Push, many of the must-run cards in these colors are low on utility, which clashes with yet another Delver school. Besides addressing the problems outlined in the Esper version directly, my second build included red for its utility and for the allure of an aggro-combo gameplan. Red provides many utility options in Modern, including the king of utility, Lightning Bolt. Bolt’s ability to provide reach (a whole attack’s worth) or board control makes it a stunningly good card, even in this metagame. The card’s relevance in a Delver of Secrets deck also cannot be overstated. Delver decks like interacting on either player’s turn, racing in the sky and with direct damage spells, and breaking up creature synergies. Bolt just does everything the deck wants to do, unlike a card like Fatal Push; our goal is frequently to just kill our opponent before their strategy comes online, so cards that excel at bringing us into the late-game are only sometimes relevant. Another draw to the color are the sideboard options. Kolaghan’s Command and By Force are significantly more employable Chalice of the Void-destroyers than Disenchant (barf). The best red sideboard card, though, is Pyroclasm, which I’ve been swearing by for years. Two damage is often as much as 3 when it comes to go-wide matchups, and the one mana of difference between Clasm and Anger of the Gods—adding insult to injury, the one colored mana of difference—makes an enormous difference in a deck with cantrips. Pyroclasm is definitely worse with Vanguard than it is with Wild Nacatl, which is unfortunate, but I think it’s still the best at its job. We can also take 4 damage to protect Vanguard if we need to. It’s not red, but Collective Brutality was moved to the mainboard in this version for even more utility. The card synergizes with Claim // Fame and alleviates life point tension, all while being a strong interactive card in its own right. The color also gives us multiple reliable gameplans. While Death’s Shadow and form something of a combo together already, supportive red cards make their cute interaction into a viable way to cheese opponents and steal games. First up, let’s consider Temur Battle Rage, one of the most pushed aggro-combo enablers the game has ever seen. Battle Rage was fine in Jund Shadow, but things get silly with in the picture. Since Shadow can now grow into the double-digits whenever we see fit, a pair of these makes our aggro-combo plan into something opponents must respect. To make room for Battle Rage, I axed some of those clunky counterspells; proactivity is generally valued higher than interactivity in Modern anyway, and we no longer have Disrupting Shoal to worry about. Next, we get Claim // Fame, which I think Counter-Vamp is primed to abuse. The above Esper build didn’t use the graveyard enough for my tastes. One mark of successful Modern decks is their ability to straddle the line between using the powerful graveyard-based spells available and becoming too reliant on those synergies; ideally, we can sufficiently punish opponents that bring in too much graveyard hate by ignoring it. Claim // Fame is our nothing-without-a-‘yard card, as Tarmogoyf is for Counter-Cat. Its haste function further buffs our aggro-combo dimension, and Claim can notably return against those pesky Liliana of the Veil decks. Besides Unearthing either half of our “combo,” the card revives Delver of Secrets when we need an aerial threat and Snapcaster Mage when we need a given instant or sorcery in the graveyard. Including Claim // Fame pushed me to max out on Thought Scour and cut the second Tasigur for another Snap. The issue I had with after some sets with this build is that it might not do enough for its cost. Three power for two mana is nothing to write home about; the card costs twice as much as Wild Nacatl! Plus, it doesn’t wall Goblin Guide, survive Pyroclasm, or even block an undelirious Grim Flayer on defense. Heck, Liliana, the Last Hope can pick it off as easily as a Spirit token. Against noninteractive matchups, two mana is an awful lot for three power. Perhaps the card’s combo implications with Death’s Shadow make up for this downfall, but in some games, I would draw one and not the other and fail to apply enough pressure. And if opponents prioritize killing Death’s Shadow, Vanguard gets even worse. Another issue with Vanguard is that some decks are happy to use their removal spells as reach. Take Jeskai Queller, a burn-heavy tempo deck that wins on opponent’s end steps over the course of four or five turns. An unstoppable beater would be great against this kind of deck, but Vanguard’s only unstoppable if we choose to actively advance Jeskai’s gameplan. Ironically, Tarmogoyf is much stronger against this removal-packed deck, as it doesn’t play Fatal Push. And there’s the crux of it: as I said before, Goyf is still Goyf. Vanguard is not Goyf. Its application with Shadow and Battle Rage needs to carry the card, since Vanguard itself is just too weak and fair. At the end of the day, while Vanguard is better than Goyf against Push specifically, too few decks play Push to make up for its other shortcomings. The mana was actually pretty good in this deck, but then, I’m no stranger to sculpting land-light, four-color manabases. I still ran into some games where I’d have all four colors across two lands, including a Godless Shrine or Blood Crypt that couldn’t tap for anything. The solution to this problem is to tweak the color layout of the spells, accounting for colors as I would for mana curve; there’s also surely a practice element at work, and more time playing and fetching would likely lead to fewer games with a dead land. Is this deck a worse Grixis Shadow? In short, yes. But that’s what you get for playing Delver of Secrets in Modern these days. I liken it to playing non-Mentor cantrip decks in Vintage; while Delver used to form the cornerstone of the Preordain–Gush strategies there, since Monastery Mentor‘s release, blue decks have uniformly revolved around the more compact win condition. The main reason to play something like Counter-Vamp is wanting to play something with Delver of Secrets in it, which honestly isn’t such a bad reason in as open a format as Modern. But at that point, I think I’d still rather play Counter-Cat. The beauty of brewing is that as problems are identified and solved, new problems arise, sometimes as a result of another fix. This constant stream of challenges is what makes brewing such a stimulating and interesting part of Magic. Often, after a certain amount of testing and tweaking, I’ll find that the “optimized” version of what I started with is an overall worse version of an existing deck; other times, I’ll lose interest in the brew after a few drafts, perhaps ceasing to explore my options before developing a worthwhile deck. And occasionally, I’ll stumble across something fun and unique like Eldrazi Stompy or Counter-Cat, and continue playing it indefinitely. As always, I raise my glass to Wizards for continuing to print interesting cards like that get my creative juices flowing. Which cards from Ixalan have you brewing? Share with me in the comments. Interesting. 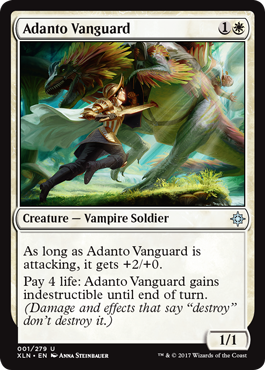 I wouldn’t have expected Adanto Vanguard to have sparked such interest, but the card did have some potential in retrospect (could it have been Modern-playable if it had been a 2/2 base?). I think the card that pulls to me the most in the current set is Deeproot Waters. It doesn’t fit into classic Merfolk, but I wonder if there will be some way to make use of it. Man, it would have been great at 2/2! I wish! My problem with Waters is that it doesn’t immediately impact the board, but I can see it working in a more passive post-board plan for Merfolk against attrition decks. Of course, the attrition decks of today are quite proactive (Shadow), but I still like its stream of chump-blockers/islandwalkers. Strangely enough, I believe Adanto Vanguard would have opened the possibility for straight Mardu/Orzhov variants of Death’s Shadow lists had it been a 1 CMC that became a 2/1 whenever it attacked as opposed to 2 CMC that becomes a 3/1. The fact the activation cost has no limit to how many times it can be activated in a turn, phase, or step enables aggressive plays with Death’s Shadow, and if they were both 1 CMC, then the possibility could have been there for value via Ranger of Eos and Proclamation of Rebirth. Anyhow, interesting read; has me hoping for some Suicide brew, even if it does get demolished by Burn. At 1 CMC this card would have become a Modern staple. Tweaking to beat Burn is quite manageable for most decks, including Shadow, thanks to stuff like Brutality and Shadow itself. Mono U Delver with Siren Stormtamer. I’ve been running a list that uses Ornithopter/Memnite and Rapid Hybridization/Pongify to basically blank my opponent’s creatures while running a functional twelve nacatls. but it stumbles on not drawing live threats if they answer my first two. Stormtamer gives me a card that can beat early game, protect delvers, and is a live draw later. So I’ll likely ditch Ornithopters for something that can aggro better. I’ve also been trying a brew with Grixis token donation, using Rampaging Ferocidon, Trespasser’s Curse, and blood seeker. It then uses Forbidden Orchard and Hunted Phantasm effects plus bounce spells to bleed my opponents out. It’s been doing okay, but it has “drawing the wrong half of the deck” problems. If it can keep a hand with two punishers and a good payoff, it can just burn somebody out like turn 4, but sometimes it just flounders. The reason you’re stumbling on landing threats is probably because you have to two-for-one yourself to get a 3/3 Ape. What you’re essentially doing is playing six Nacatls (Delver and Pongify), but the last two only work if you also cast a 0-mana Chain of Silence, which also costs you a card. If you’re running Stormtamer, though, I’d suggest a Bonesplitter or two. The -1 of casting an equipment will be rapidly offset by the damage your fliers deliver in many matchups, unlike the -1 of Pongifying your own creature.